For as long as author illustrator Tad Carpenter can remember he has always wanted to write and illustrate children’s books. As a child he would sit with his parents every night as he prepared for bed and would read picture book after picture book. He would dream about the stories he may one day tell. Tad was lucky enough to grow up with a father who was also an illustrator and has illustrated dozens of books within his career. Growing up watching and learning from his father has always been Tad’s biggest source of inspiration. 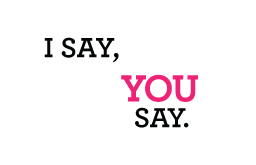 When Tad began creating the I Say, You Say series it was a goal to create a series that put an importance on visual literacy. Creating a series that was colorful, playful and encouraged interactive learning through basic techniques like prediction and repetition was what he was after. But really, most importantly, Tad wanted to create a series that was super, duper, crazy fun and that everyone in the family could take part in and enjoy.